JK Findings is a multi-capable manufacturer using some of today's most advanced multi-axis CNC lathes and CNC mills to provide high quality custom machining of close tolerance precision products. 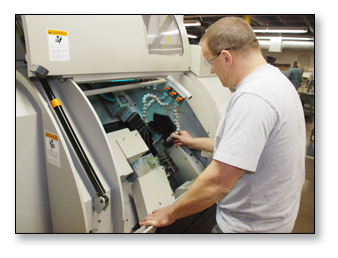 Our equipment offers the ability to machine-finish components without secondary operations, resulting in shorter cycle times. From your sketches, prints, or CAD files we can machine your custom components from 14k, 18k, .925 silver, stainless steel, and most other metals as required up to 20mm in diameter. To learn more about our precision mechanisms and applications, view the informational videos below. Precision machined bezels are used for setting stones into drops, connectors and earring components. Pearl Caprice Interchangeable Bracelets feature threaded pearl stations to allow pearls and beads with hole sizes as small as 1.8mm to be interchanged. Choose from four different bracelet styles and a selection of pearl, natural stone or .925 silver beads. Patent Pending. The single pearl station bracelets feature removable endcaps to allow Caprice Beads and Charms to be easily added and removed. Choose from our line of finished Caprice Flex Bangles or add your own beads or pearls to a .925 Silver Flex Bangle with pearl cups. For more information on precision mechanisms, please contact us.